Seafarers and beachgoers know ocean winds blow strong and often. Wind energy developers know it, too. Hundreds of massive wind turbines already dot the seas around the U.K., Denmark, Germany and other countries—and developers are preparing to install the first U.S. offshore turbines in New England waters. That’s bringing a growing source of carbon-free—though still costly—electricity to power-hungry coastal cities. The structures that hold most of these wind turbines above the waves are not viable on the West Coast, however, where the continental shelf drops steeply just a few miles from shore. The deep water makes pounding foundation pilings into the seafloor unfeasible. But there’s a solution to this problem—floating turbines. The world’s first floating offshore turbine was built off the coast of Norway in 2009 as a demonstration project. 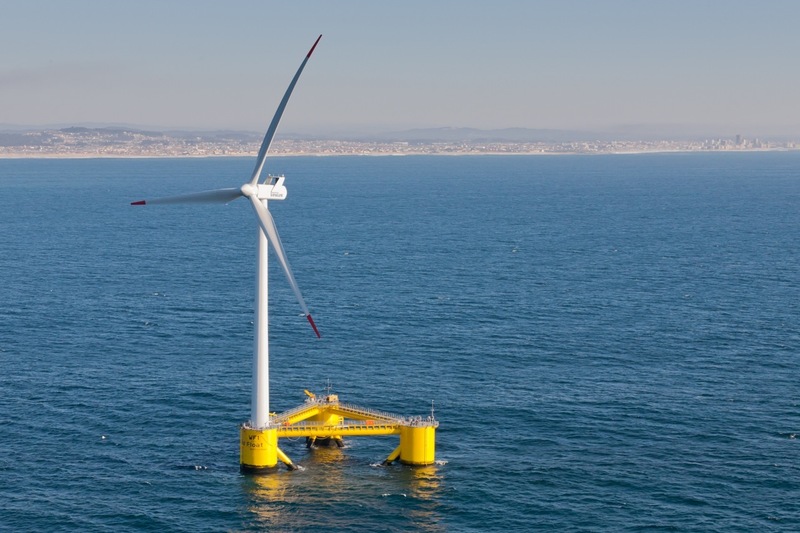 And now, floating platforms may be the foundation for offshore wind projects on the West Coast. The engineering is challenging. The floating platforms must be stable enough to support a wind turbine with blade tips reaching 600 feet above the ocean’s surface. They must be strong enough to survive powerful storms and 50-foot waves. The electricity generated must reliably travel 18 miles back to shore. And the high costs of the first demonstration projects must be reduced for floating wind power to compete with traditional offshore wind turbines, and other energy sources. But Principle Power, which has staff in Portland, OR, Berkeley, CA, and elsewhere, believes its technology is viable. It has already demonstrated as much on a smaller scale in Portugal. And in recent weeks, the project, called WindFloat Pacific, has gained momentum. In early May, Principle Power snared a $47 million federal grant from the Department of Energy—one of three awarded to innovative offshore wind projects. At the same time, the company joined forces with Deepwater Wind, which is developing a traditional fixed-foundation, 30-megawatt offshore wind project off of Rhode Island, and which also won last summer’s initial federal auction of offshore wind power leases, outbidding two competitors and taking the rights to develop wind energy in a 250-square-mile area off Rhode Island and Massachusetts. Under its agreement with Principle Power, Deepwater will be responsible for the commercial agreements, financing, and permitting for WindFloat Pacific, while Principle will be the platform technology provider. In the best case, the floating turbines could be installed in 2017. Overall, the potential for offshore wind energy is enormous. U.S. waters, including the Great Lakes, have a “technical wind energy potential” of 4,150 gigawatts, according to a 2010 Energy Department study. That’s about four times the current capacity of all U.S. power plants. Of course, only a fraction of that resource might realistically be developed. The Energy Department’s 2011 National Offshore Wind Strategy (PDF) calls for 54 gigawatts of wind generating capacity to be built in U.S. waters by 2030. That’s still roughly equivalent to the capacity of about 50 nuclear power reactors and is 10 times the amount currently installed globally, mainly in Europe, which is leading the way in this industry. While offshore wind in general is more expensive than building wind farms in Iowa cornfields or on California hilltops, it has a number of advantages. The ocean winds are typically stronger and more consistent. And offshore turbines are located relatively near to coastal population centers, avoiding the need for access to crowded high-voltage transmission lines—a bottleneck for projects in the nation’s windy interior. Floating wind turbines bring additional advantages over fixed units. Because they can be placed many miles offshore, they would be barely visible from land. That greatly reduces the potential for the kind of fierce opposition from coastal residents that held up the nation’s first proposed offshore wind farm, the Cape Wind project in Nantucket Sound, for more than a decade. The opponents fear losing their pristine views. In addition, the floating wind turbines can be assembled at a deep water port and towed out to sea by standard tugboats. In contrast, fixed-foundation offshore turbines require expensive specialty vessels and crews to install on site. That is risky work that requires extended windows of fair weather. And the entire floating unit can be towed back in for major repairs, if needed, rather than ferrying crews and parts out to sea. These advantages will translate into cost reductions, proponents say, which are essential to offshore wind’s competitiveness. Principle Power’s design is based on established technology used in the offshore oil and gas industry. Each WindFloat floating platform has three tall vertical columns. The columns are connected by gangways and other supports, forming a triangle, and are moored to the ocean floor with conventional chains and cables. Attached to the bottom of each column is a heave plate, a heavy metal sheet that dampens motion and helps maintain stability in ocean waves. A standard wind turbine tower and three-bladed turbine is mounted on one of the columns. electricity is sent to shore by sea-bottom cables. Principle Power bought the intellectual property covering the WindFloat design in 2009 from Marine Innovation and Technology, in Berkeley, CA, and recruited co-inventor Dominique Roddier as its chief technology officer. The success in Portugal is what convinced Deepwater wind to join the WindFloat Pacific effort, Grybowski said. Engineers are focused now on scaling up the WindFloat to accommodate the larger-capacity wind turbines, and to incorporate lessons learned from Portugal on design, fabrication, and other “incremental things” that will increase efficiency and reduce the cost of the structure, Banister said. Meanwhile, the developers must get permits from federal and state fish and wildlife and ocean regulators, among others, and find a buyer for the power WindFloat Pacific would produce. WindFloat Pacific’s backers aren’t ready to talk about the price of power from their project, having begun discussions with potential utility customers only recently. But the cost of power is likely to be significantly higher than a competitive market rate. In addition to the utilities, another potential customer is Jordan Cove Energy, which is seeking permission to build a power-hungry liquefied natural gas plant and terminal near where WindFloat Pacific’s transmission cable would make landfall. Banister noted that this is a demonstration project, not a utility-scale commercial project that would compete with established technologies. “What it’s intended to do is show the quality of the resource, show the viability of the technology, and educate the utilities, through their participation, about what all of this might mean as they seek to serve their customers’ loads,” he said. Once the technology is proven, the biggest question mark is whether floating wind can become cost competitive with other forms of power. The U.S. Energy Information Administration’s latest Annual Energy Outlook does the best job of comparing various energy generating technologies side-by-side, providing a so-called levelized cost of electricity that accounts for factors including fuel cost, utilization rates, and operations and maintenance expenses. In its latest analysis, which estimates costs in 2012 dollars for new power plants that would begin service in 2019, offshore wind comes in at $204.10 per megawatt hour of electricity, falling to $170.30 in 2040. Compare that to land-based wind at $80.30 per megawatt hour in 2019, which is cheaper than hydroelectric, solar, biomass, nuclear and even some natural gas plants. The costs specifically for floating offshore wind are harder to estimate, since the technology is so new. But offshore wind proponents note, rightly, that wind and solar prices have reached their current, competitive cost levels after decades of technology advancement, industry growth (and attendant economies of scale), and reduced risk—and therefore financing costs. Now, they hope offshore wind will take a quicker journey down the cost curve than the EIA projects. In the National Offshore Wind Strategy, the DOE estimates that the power price of offshore wind will drop to $70 per megawatt hour by 2030, though that may be optimistic. For offshore wind in the Northwest to succeed, it must not only reduce costs but also get the timing right in the marketplace. Right now, there’s little new demand for energy in the region, thanks to the lingering impact of the recession and standout energy efficiency efforts. But a window of opportunity will be opening. “Where the market really is, is in replacing the retiring coal plants, and there are many of them,” Shimshak said. The last remaining coal power plants in Oregon and Washington, with capacity of about 2.5 gigawatts, are already scheduled to shut down by 2025. Coal plants across the country are under competitive pressure from America’s newfound supplies of natural gas. New limits proposed this week by the Environmental Protection Administration on carbon dioxide emissions from existing power plants, as well as state-level actions such as Washington Gov. Jay Inslee’s recent executive order aimed at reducing imports of electricity from out of state coal plants, are further ramping up the economic and political pressure on coal power. If WindFloat Pacific stays on schedule—with installation as soon as 2017 under a best-case scenario—it could emerge as a proven technology just in time to fill some of the gap left by coal. For that to happen, project proponents must allay any local environmental concerns. As the first of its kind, the project will face skepticism from state and federal fish and wildlife officials whose job it is to protect species and habitats, Copping said. “Getting wind in the water isn’t necessarily what they are going to be rewarded for,” she said. The relative lack of sea life in the deep ocean waters unlocked by the floating platform technology means there are fewer environmental concerns to begin with, she said. “As you go away from shore anywhere in the oceans just about there’s less production of phytoplankton, zooplankton. There’s less food so the number of animals thins out,” Copping said. There are some large ocean-going bird species, including the endangered short-tailed albatross, but these tend to soar below the height of wind turbine blades, she said. Migrating whales could become tangled in mooring equipment and power cables connecting the WindFloats to each other and then down to the seafloor for transmission to shore. Regulators will also want to know if the noise and vibration from turbine operations could have an impact. But Principal Power says that the turbines will be anchored outside of whale migration routes. And the fact that the project doesn’t require pile driving (the noise from which can significantly affect marine mammals and is highly regulated) removes another major problem. And environmental regulators might also take comfort in knowing that the WindFloat can be completely removed from the ocean in a worst-case scenario. “That’s the ultimate mitigation no one wants to talk about,” Copping said.